This novel is one of my all-time favorites. Ever since its cover caught my eye on the sale table at Borders in Goleta, CA, this book has had a special place in my heart. I read it when I’m feeling lonely, when I want something light to read, when I want a good story about deep friendships, and when I just want a good book to settle down with. I’m not generally one to reread books, but I’ve read this one 4 times now. It just never gets old, and I find that I continue to recommend and gift it to friends and family members.Part of the reason I love this book so much is that it spans 40 years in the lives of 5 women who share a great friendship with each other. It’s one of those stories about relationships that makes you appreciate the ones you have — makes you want to pick up the phone and call the people who matter to you. And it’s really cute! 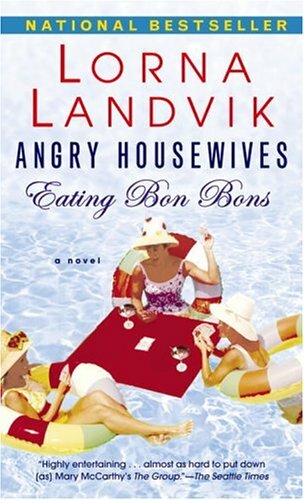 The five Angry Housewives are all easy to relate to, and are so likable that it’s hard to set this book down before finishing it.Not only that, but the plot is full of political issues (race, gender, and sexuality being at the fore) that Landvik deftly weaves into the narrative without detracting from the storyline. It makes you think about the issues it raises while avoiding hitting you over the head with any one specific political agenda. Well, alright, so the feminist slant is pretty strong…but that gets balanced out by the significance of these women’s roles as mothers and wives, so even there ideas of gender roles gets complicated by the seemingly traditional role these women play within their own households.In any case, it’s a book I’d recommend to anyone (male or female) who’s looking for a genuinely good story about friendship and life.